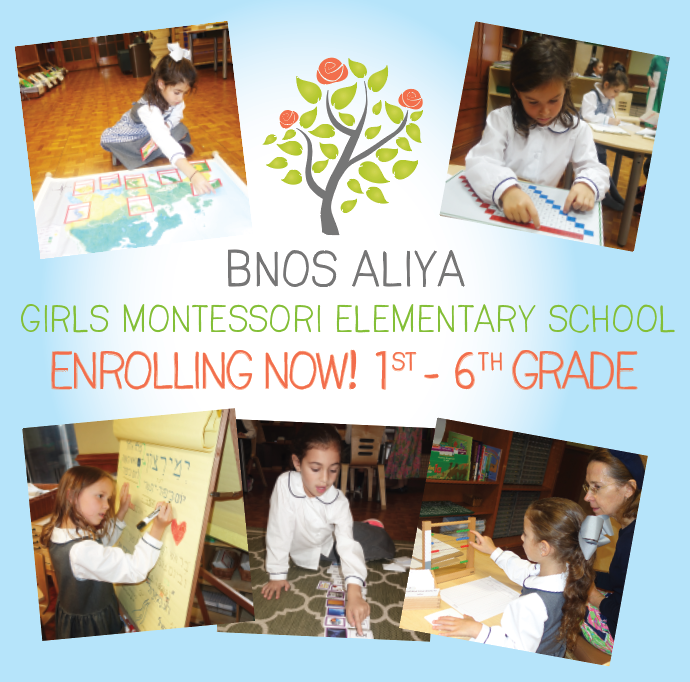 Bnos Aliya is a girls elementary school that offers girls, with Hashem’s help, the highest standards of both limudei kodesh and general education in the exceptionally joyful, individualized and creative “Al Pi Darko” approach developed by Rabbi Jonathan Rietti based on Montessori. Bnos Aliya engages Rabbi Rietti, Morah Brocha Margolese Baum, Educational Director of Darchei Noam Montessori, Executive Director and Founder of Alef Bet Montessori School, Dr. Julianne Costa, and other educators to guide the curriculum, teaching and individual child development. After a spectacularly successful inaugural year, Bnos Aliya increased its enrollment for 2018-2019 by 50% and added a third grade. Bnos Aliya plans to add one grade each year through 8th grade as it grows along with the students of its pioneer class. Mrs. Amy Hope Friedman leads as Head Teacher with colleagues Miss Miriam Kaufman and Mrs Perele Horowitz.